I have been contemplating going through the ol' choppity chop. It's getting long and on my nerves. So is the cycle of me and my hair. Cut short, let it grow, gets on my nerves after a certain length and gets chopped off again. I've been looking, lovingly at beautiful and cute hair cuts but still can't bring myself to go through with it. You see, this is the longest that my hair has been in quite a number of years, and I really like versatility that I have with my hair. I can wear it up, down, half up, curly, wavy, straight, or any combination of the above. And with summer around the corner, I'm nervous about not being able to throw my hair in a ponytail or in a hat at the beach. But then the other part of me thinks that I would much rather have shorter hair to mess with than longer hair when the heat and humidity kicks in. I was noticing last week how long your hair has gotten. I like it the way it is :) If you must have a change, I'd go with layers. You can get a really different look without losing all your length. Have you asked your sister's advice? Honestly, I love the layers look even on short hair. I had very long hair up until a year ago. I then chopped it off AND gave myself bangs. Never again! I love my longer hair and NO bangs. 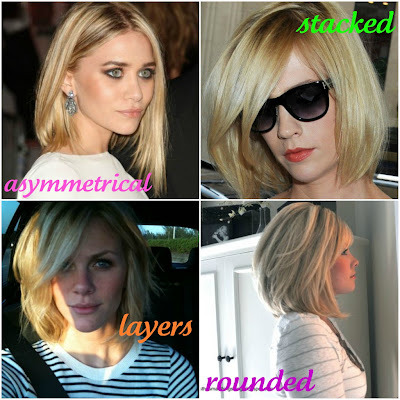 But, one thing is for certain...Have to have layers...It adds volume and allows you to do a lot with your hair. I think shoulder length is minimum for me if I ever cut my hair again... The rounded one wouldn't be for me because for it to work I'd have to curl my hair EVERY day. Not going to happen :) I think if you're going to go shorter...Go layered :) If I remember correctly...You have a sister who rocked her hair in high school :) I'm sure she could give some good advice! I love it long, but I also like that rounded or that stacked look. I do the exact same thing with mine and I keep going back and forth about cutting it…mine's about your length now and I keep thinking, "Do I want it to be easier/faster to dry? But then what if I'm running late because instead of just putting it in a bun I have to actually style it." I really like the stacked or rounded look myself and because we're practically the same person, I think you should go with one of those! I think after my birthday (in July) I'm going to cut mine. super cute. i vote stacked. love that look! I love the stacked and rounded looks! I think both would be really cute on you! I love the rounded looked! Can't wait to see what you do. I seem to grow my hair out and then hack it all off on a yearly basis. The girl with the rounded hair cut has a blog on youtube, I found her on pinterest and I LOVE LOVE LOVE her blog, she shows you tens of millions of hair ideas with this hair cut..... hope this helps. Yes, I saw that when I found the photo. TONS of inspiration. Thanks!